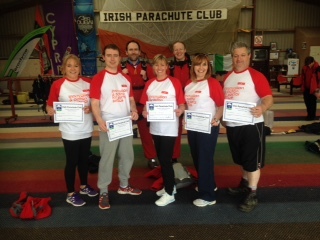 A big congrats to our charity jumpers from Finglas Youth Service / Cross care, who jumped with us last Wednesday the 20th May 2015. We hope that all tandem students enjoyed their experience this weekend and don’t forget that you can book in for one of our Solo jumps and get a big discount……..
We hope to hear from you all soon. PreviousPrevious post:Weekend OpeningsNextNext post:More Tandem Students from the weekend! !